Never have we been more conscious of how our actions affect the everyday environment around us. After two decades of this topic being placed under a blazing spotlight, as a society we know that going green is no longer a good thing to do, but essential if we’re to at least slow the impact on the world we live in. 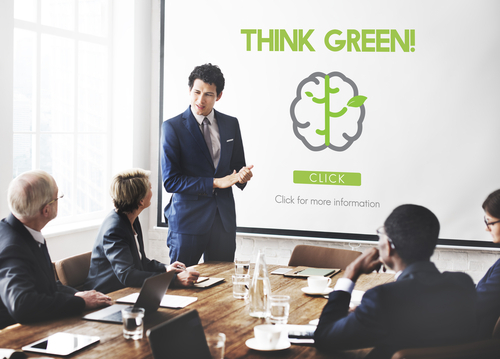 For you, as a business owner, going green can appear complicated, time-consuming, and dare we say it – expensive. Yet it really needn’t be inconvenient, and taking steps towards eco-enlightenment could and should serve as a booster to your bottom line. SMEs account for 20% of the UK’s C02 emissions, and are responsible for a quarter of all the UK’s waste. They’re also estimated to waste a combined £1 billion worth of energy each and every year. It’s clear – there’s a lot to be done if the war on waste and commercial consumption is to be won. Scary figures indeed, and if you’re considering going green, you’re not alone – as many as eight out of ten business bosses have set their sights on being more sustainable. Yet many remain overwhelmed by what’s seen as a mammoth task. You don’t need to aim for going carbon neutral or being powered by renewables and renewables alone. Small, simple changes can revolutionise your hoof print on this planet we all share. As for your reward for saving the planet? Consumers and fellow businesses are more eco-minded than ever before. So much so in fact, that going green is actually great for the bottom line. Out in the world of consumers, 95% of people say protecting the environment is important to them; three out of four Millennials are willing to pay more for products from sustainable companies and businesses that embrace environmental responsibility are more profitable – outperforming their competitors. 1. Managing manure – formulate a detailed plan documenting how manure is being managed on the farm in an environmentally sustainable way. 2. Dry or turnout lot management– implement practices to ensure there is no runoff from these areas. This could be as easy as planting a vegetative filter strip. 3. Soil testing– A relatively inexpensive task, this should be completed every 3 years, especially if you are interested in growing sufficient forage in pastures for horses to graze. Stay up-to-date with your energy and water meters, as well as waste disposal bills – and be sure to investigate any spikes in consumption. Replace incandescent lightbulbs with the newer energy-efficient alternatives. Drive down your water usage by using a toilet dam – the Hippo toilet dam saves an impressive 3 litres for each and every flush. Attempt to go as paperless as possible – review your administrative processes, could anything be digitally automated (saving you time and money in the process?). Review your current suppliers – what are their green policies? Could you improve your own eco-standing by finding new suppliers? Reviewing this alongside your current supplier prices can also serve as a cost-cutting exercise. Create a sustainability statement that lays out the aims of your business in terms of energy and waste saving. 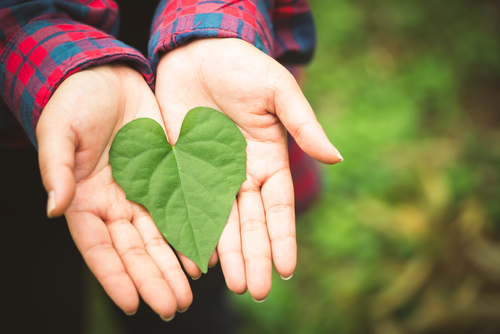 Make sure you’re confident that your business complies with environmental regulations – this general article from Law Donut is a good starting point. Forge connections with fellow equestrian eco-warrior businesses – and look for opportunities for mutual co-operation with other companies in the area. Create partnerships between staff and the wider community – are there local green initiatives that you could become involved in? Ditch the plastic – in the office, you could offer glass alternatives to plastic bottles and reusable thermos bottles; you could also consider alternatives to plastic wallets and filing systems. Engage your employees – create a pin board for suggestions for being greener. Remind everyone to recycle and make the recycling bin easily accessible. Push for green working – ask your employees to turn off the lights when a room isn’t in use; keep heating to a comfortable level; close doors to reduce energy loss and operate machinery and processes in the most efficient way possible. Working alongside the local community or with fellow equestrian businesses on a green initiative can make for fabulous PR, so be sure to contact local newspapers or industry publications about your good news story. Track your energy and waste savings in concrete figures – such as the fall in bin bags sent to landfill, the drop in gas used in the past month or the CO2 emissions you’ve cut out of your business processes. Use these figures to update your social followers and newsletter recipients month on month. This includes your website and emails, as well as any brochures, flyers and business cards. The facts, stats and figures in relation to businesses and the environment are nothing short of grim. But your approach to customer communications needn’t be. When you first consider how you’ll tell the world about your efforts to go green, make it positive and talk about your targets. Describe what the future looks like for you, and bear in mind what ethical and environmental concerns are relevant to your target market. If you’re a retailer, wholesaler or sell products in some other form, consider reviewing your products or adding to the line-up – is there a green (or green-er) alternative?66% of consumers are willing to pay more for sustainable goods, so you may find such products prove to be more popular than you imagine. Create the feel-good factor by telling your customers that you donate a portion of your profits to charity. This simple step can make customers feel as though they themselves are contributing to steps forward for the planet. 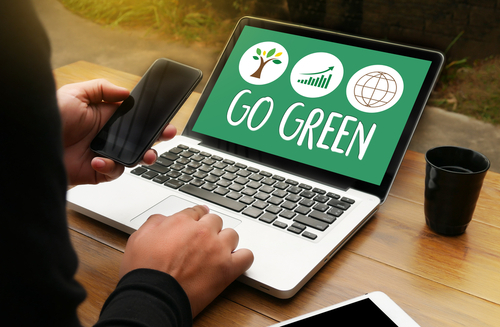 Going green is undoubtedly capable of growing your profits, while also having important benefits for the environment that have never been more important than they are today.